Financial planners often advise their retired clients to downsize their home as part of an overall strategy to simply life and to create retirement cash flow. Homeowners who are facing issues related to advancing age are often overwhelmed with the care and upkeep of a big home. Retired homeowners should consider their options - some people just want to move across town into a condo or townhouse. Others may want to re-locate closer to family on the mainland. Some may want to keep their big home and use it for rental income, while re-locating into a smaller, more manageable home. Others may want to move in with children or into a retirement home. Each circumstance is unique and each option deserves some consideration. Moving into a condo or townhouse frees up the homeowners from having to maintain a yard and possibly a pool. Owners no longer must keep up with exterior painting and roofing repairs. Homeowner’s insurance premiums are less in a condo or townhouse because the building will carry hazard insurance and if the value of the condo is less than the value of the house – property taxes will be less as well. Often communities have nice amenities for residents – a pool or a hot tub, a weight room, a meeting room, etc. If a homeowner is already use to paying monthly for yard care, pool care, pest control, utilities, along with maintenance and repairs then the monthly maintenance fee at a condo or townhouse may seem reasonable in comparison. Moving often follows new opportunities, a new relationship or a new adventure ahead. For an older adult the "new" opportunity may feel like a mixed blessing. On the positive side, a move may offer a sense of "lightening" to reduce messy clutter, to have fewer home chores and also can help reduce feelings of isolation. However, moving is a high-stress event. Tackling the organizing, packing, discarding, cleaning, paperwork and the myriad other tasks can be a major challenge or a stumbling block. It’s best to start well ahead of any moving plans. It is much more challenging if you are facing a crisis, moving quickly and leaving behind all your things for children or others to sort through. Many owners may not realize that contacting a Realtor can be an invaluable help to the process. A well-connected Realtor will have great contacts for moving, organizing, cleaning, repairing, etc. You may also want to find out what the home would rent or sell for. Here are some tips/checklists to help with the process. Select the areas that apply to you, and customize with your own notes as well. If you are an adult child helping your parent make this move, you’ll find advice on how to be both supportive and efficient as you and your loved ones manage this major life transition. If you have the luxury of time, begin to de-clutter before a move is imminent. Six months or a year prior to moving is not too early to start this process, regardless of where you plan to move or even if you are still deciding. Shred, toss or give away items, such as: old cancelled checks, outdated food or medications, clothes, or extraneous household items that just take up space. If you're not sure, ask an accountant or tax person what records should be kept. De-clutter room by room in two-hour blocks until you’ve gone through every space in your home. You'll be surprised at how much you can eliminate once your start thinking in advance about moving. Collect and keep together important papers: deeds, wills, Durable Powers of Attorney, medical records, military records, diplomas and degrees, insurance, birth certificates and passports. These should be stored in a locked file cabinet or safe-deposit box, but let key family members know where they are. Do not to allow grown children (or other family & friends) to use your home for storage or as a museum. Now is way past the time for them to claim their keepsakes—old sports trophies, CDs, posters, school projects. Limit sorting and packing activities to no more than two hours per day. If you are helping your parent, try to keep it relaxed and companionable. Have a cup of tea (or glass of wine! ), and take breaks. Make lists: start a separate notebook just for the move. Keep it with you or put it on your phone, and whenever you think of something—anything related to the move—write it down. Include to-do lists, a calendar/timeline, things you might forget, questions, notes about possessions, or even remarks like "Aunt Judy would love the tea set." Although notes may not be in a particular order, at least you'll know where to find moving information. Get estimates from moving companies. Many people will pare down what they are moving to the mainland with after finding out the expense to take all their household items. Set a timeline for your move. If you plan to sell or rent your home, talk to a Realtor about the timeline for bringing the house on the market. You may also want to discuss with your agent, what furniture should remain in the house for staging purposes vs. what is best removed. If you or your parent is more comfortable with thorough advance planning, make a floor plan or template of the new home. Be sure measurements are accurate, and reflect the placement of doors, windows, appliances, built-in shelves, linen storage, etc. You will now know precisely how much space you will have and won't need to guess. Make a plan of where furniture will go — the bed, couch, table and chairs, TV, bookshelf, dresser and desk, etc. If pieces can serve more than one purpose, all the better. If finances allow, think about hiring help for the cleaning and organizing. A real estate agent should be a good referral source, or get recommendations from friends. If needed, remember to start/stop utilities such as gas, water and electricity. Refill prescriptions in advance of the move. Next month will we continue with part 2 of this article with tips on sorting, purging and packing. Start sorting with the easiest room first. Don't try to pack yet, just sort. donate, sell or give away to a friend. You can use colored tags or stickers to indicate in which category items belong and continually donate items to thrift stores as you come across things. Items that have sentimental value but are not likely to be taken can be memorialized in photographs. Later, you can put these on a DVD or into an album. Don't try to sort paperwork or photos at this point, unless it's immediately obvious certain items are not needed or wanted. This kind of decision-making takes too long and is draining. Pack it up and it can be sorted in the new home. Shred discarded paperwork. The number of kitchen items can be greatly reduced if you are going into a residence or facility that serves meals. If you are helping a parent, be sure to run specific items by them – they may find a particular can opener easier to use, for example. If possible, and if the move is not far from the family home, move out first, taking only the furniture and items wanted and needed. Leave the rest of the household goods and the clean-up to be dealt with after the move. This way, items will be available for retrieval if it turns out they're missed. 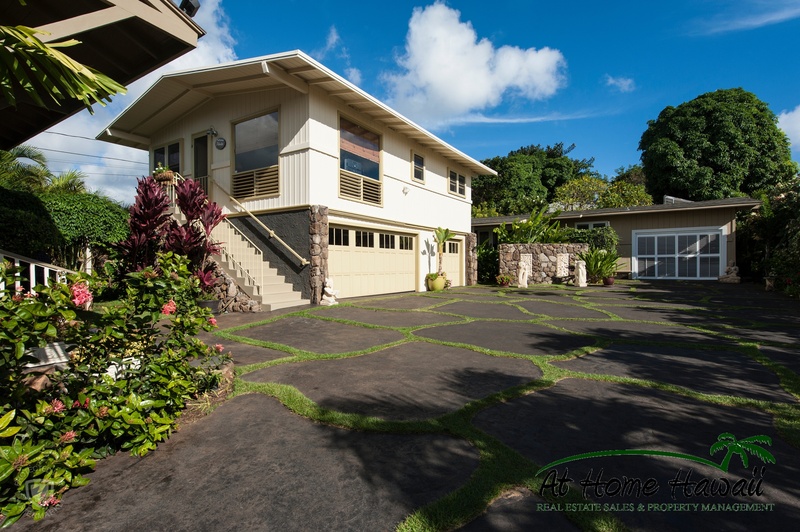 Recently, we met with a potential client about renting her 93-year-old mother’s Kailua home. Her mother had moved into Pohai Nani in Kaneohe on a 1-month trial basis and decided she liked it and would not be returning to the family home. Consider renting the home for a year before making the irreversible decision to sell it, especially if your housing market is stable or rising. You may consider talking to an agent knowledgeable in both the rental market and the housing market. On a separate note: it is usually NOT a good idea to transfer a parent’s home into a child’s name due to potential capital gain taxes, but that is a subject that needs a whole separate article! If you are helping your parent, be patient and allow time to talk about memories, to reminisce about family activities or relatives no longer with you, to acknowledge emotions. This can be a nice opportunity for you both to remember the stories and incidents that are part of your history and that make your family unique. Don't go overboard purging items—you can take some art and collectibles. You want the new residence to look like home, not a motel room! Discard items that are so marked. You can look up bulky pick up at opala.org for your neighborhood for anything too big to put in the can. Before selling items, get an appraisal from an expert such as a jeweler, art collector or someone knowledgeable about rare books if you're not sure of their value. garage sale, if someone has time and is willing to organize and operate it. Although, consider that it may be distressing to you or your parent to see people going through their possessions. Donate the remainder of items to charities that will pick them up. This usually has to be arranged well in advance as pick ups are usually scheduled in certain neighborhoods on certain days by non-profits such as Big Brothers/Big Sisters Hawaii or The Salvation Army Family Store. Welcome others to help with packing chores: family members, friends, a professional organizer or moving company. With everything pre-labeled, the task is easier. Pack an "open first" box or two for setting up sleeping accommodations and the bathroom. Include items such as fresh bedding, soap, toilet paper, toothpaste & toothbrush, comb, nightclothes, towel, plate and utensils, one change of clothes, flashlight, tape, scissors. Pack other important items that you'll keep with you during the move: new lease or residence contract, keys, medications, legal documents, checkbook, cell phone, address book, first-aid kit, extra cash. Label this container. Valuables such as jewelry should be in a safe-deposit box unless items are worn regularly. Be sure you have a written contract from the moving company and coverage for lost or damaged possessions. Prepare to spend a few days unpacking and organizing. Get some help if you can. Work as quickly as you can to make the new space feel like home. If you helped a parent move, plan to check in often. Adjusting to new surroundings may take days, weeks, or months. Individuals' reactions differ after an upheaval in their lives. Many people feel relief at not being alone and not having to maintain a large house. Others may be withdrawn and hesitant about making new friends. Many grieve the loss of their old community and friends. However, sometimes, the reaction is: "I should have done this years ago!"